Meet Nanaimo Curling Centre’s new manager, Andrea Trepanier! Our wonderful manager Denise Wood retired in June after 20 years of being Nanaimo CC’s manager. We will miss Denise very much! We are very fortunate to have an excellent new manager – Andrea Trepanier. Let’s learn a little more about Andrea and her role as club manager. 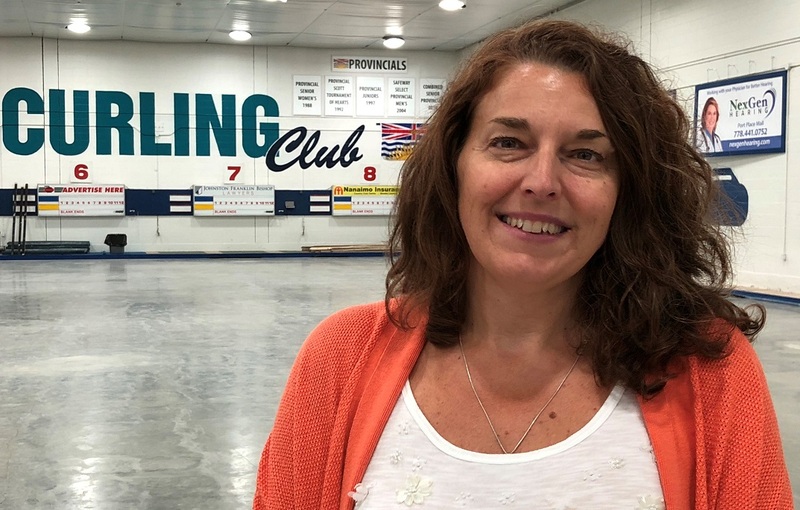 We asked Andrea what her new role as Nanaimo CC manager entails, and she responded “It is a big facility that hosts many events, not just curling. Booking and organizing those events and managing the staffing for all events and regular curling are part of my job. Ensuring the ice and equipment are maintained and operated safely and efficiently. Providing service and equipment in our Pro Shop. Maintaining relationships with our facility partner, the City of Nanaimo. Taking instruction and directives from the Board of Directors and following through. Keeping accurate records of all financial matters for the club. Ensuring all of our members have a great experience at our club…..and everything including the kitchen sink if it needs to be done!” If you’re a new curler, Andrea can help you with “registration, choosing an appropriate league for your skill level, coaching (I am a certified coach), assistance with equipment selection and purchases, information about volunteering and membership, tying a shoelace…..” In short, Andrea is our best resource for information and assistance with all things Nanaimo CC. Andrea’s current office hours at the club are 10 am to 5 pm weekdays. Her office hours will change once the season starts – keep an eye on our website (www.nanaimocurlingclub.ca) for details. To reach Andrea, call her any time at 250-713-6312 or email her at manager@nanaimocurlingclub.ca. Or just say hello to her around the club – you will be seeing a lot of her!